How to get started with Independent Work Station in your special needs classroom. My independent work station is, by far, one of my favorite centers in my classroom. It is truly amazing to watch them become so independent. The students are proud of themselves as well! There are so many self contained classrooms that just don't have enough support, this center runs on its own and needs very little maintenance. 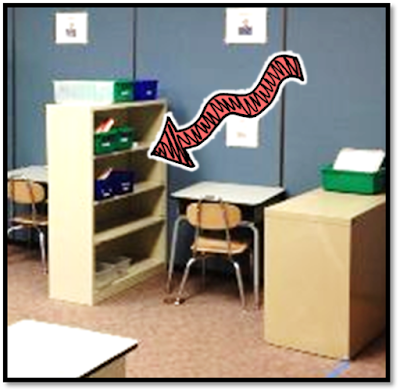 After teaching your students how to use how to use this center, your classroom should run like a dream. I know what your thinking ........ "how much work is this going to be for me?" I promise, once you get it all set up, it runs itself ALL YEAR LONG. Believe me, I struggled for years with lazy paraprofessionals, a disorganized closet full of tasks and students who could not function without constant verbal prompts. Once I implemented a well planned out center with a few organizational tips, I have so much more planning time! You'll want to find a desk or a table large enough to have a working area, but small enough to make sure that it's not distracting for the student. 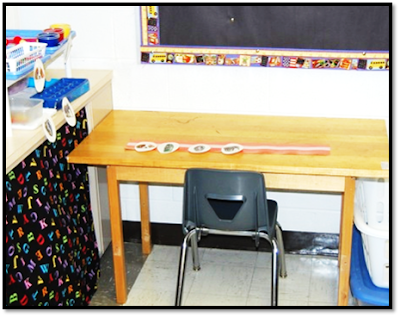 Some students with Autism who have too large of a space to work on, will often spread out their work, and lay all over the table. If your table is too large you can put tape down the center to section off the work space. You could also use study carrels. Find a 3-4 tiered shelf to put onto the left side of the work station. You can add Velcro to the front of each shelf for the matching symbols to go (unless you want to put them directly on the task boxes. Other shelf ideas could be a 3 bin storage unit or a stacked shelf. 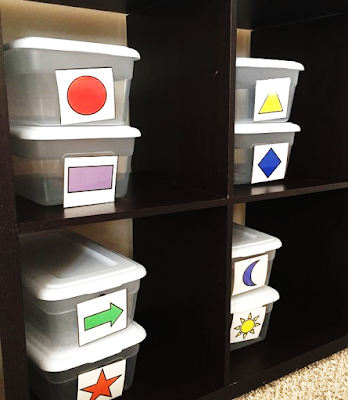 The shelf doesn't have to be cookie cutter, however you want to make the tasks accessible to the student. Find a quiet area in your room to place this new center. This center will need to go up against a wall or partition. When I worked in the elementary classroom, we could place the desk up against our movable walls. We had quiet dividers that we used to surround the center to provide a very quiet work zone. 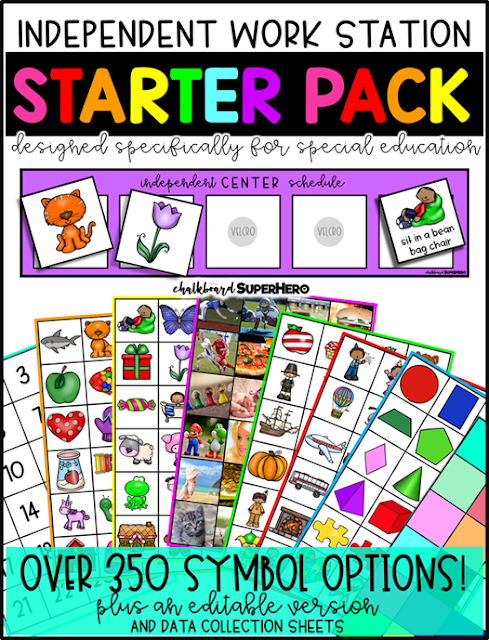 You can get this Starter Pack for FREE by signing up for my newsletter! 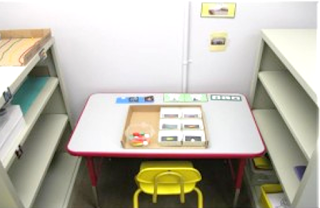 There are some materials that you will need to prepare for the independent work center. You will need picture symbols and a mini schedule. I have created a resource for FREE for you with over 350 different symbol options. You will also find mini schedules and data collection sheet. 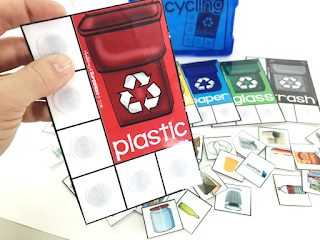 If you would like to get this resource now, go to the side bar of this blog and sign up now! You will need to print out the symbols that you want, laminate them, then cut them out. Then add Velcro. You will need two pictures of each symbol. Also, you will need the mini schedule. This schedule tells the student which task to do in which order. Place the mini-schedule on the upper part of the desk. Make sure that it is accessible for even the smallest of hands. You can adhere it to the desk with tape. Or, if you are using individual schedules, you just add Velcro to the back and switch them out as needed. 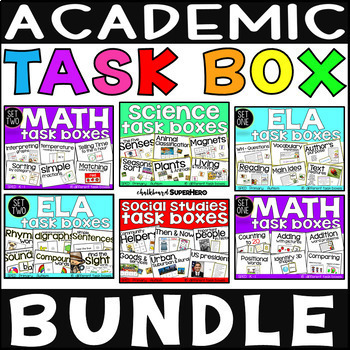 You get 96 different task boxes that cover all of the content areas (Math, ELA, Science and Social Studies). 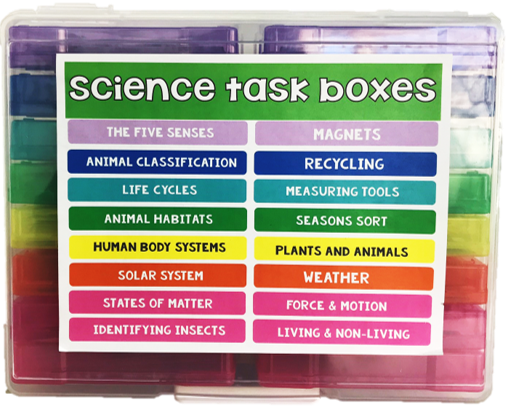 These task boxes have saved my teacher SANITY!!! Check out how I store them! Almost 100 tasks in one location. 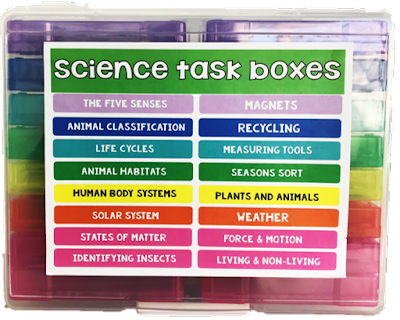 Yes, I still have bulky task boxes, but, who am I kidding, there are just some tasks that don't fit into a 4x6 photo storage box!! 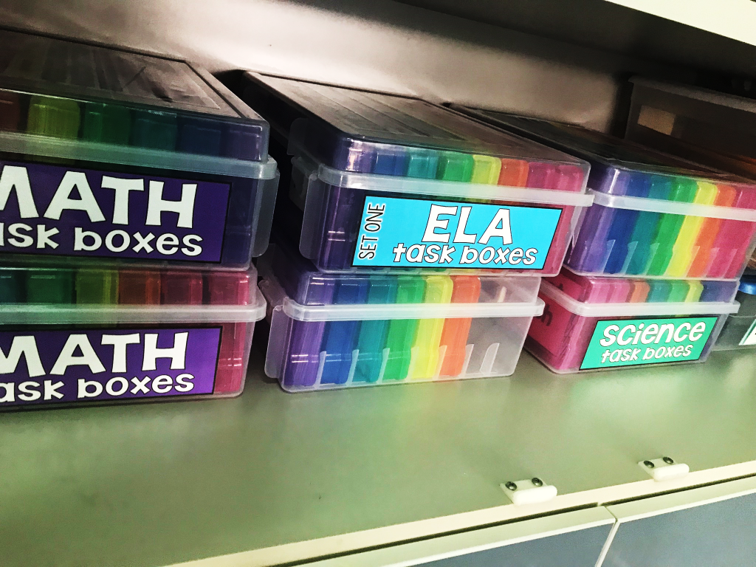 This is where I store all of my task boxes! I am currently in the process of creating 4 more task box kits relating to self-help skills, emotional skills, transition skills and more! Follow my store HERE, to make sure not to miss them!!. With my FREE starter pack you will receive 2 free data sheets. Just add the data collection sheets to a clipboard and hang them near the center. I usually put a piece of colored paper over the sheet with the child's name on it, to protect their privacy. I have included two versions, one for each child. Or just one sheet with the whole class. Or if you prefer, use your own data collection. But know that it is important to keep track how well the child is maintaining the skill and also not to give them the same task too many times in a row. Not only is it important that you teach the child how to use this center, but your aides or paraprofessionals need to be taught as well. I would sit with the adults in room your room and explain their job to set up the tasks for each child and how to record on the data collection sheets. I would often post someone near the station,a guide for the adults or rules for them to follow. You should take a week to provide staff and students with sufficient guidelines on how to correctly use this center. Students should be taught these skills or practicing them during your 1:1 teaching or small group settings. Once they are ready, let them use the center! And that is it! Once your center or station is all set up, which may take a bit of work, you should not have to think about it all year long. REMINDERS. Please note that any task that you put into the work station must be a previously mastered skill. Tasks must be 100% independent before putting them in this station. A teacher shouldn't have to read direction or set up materials. 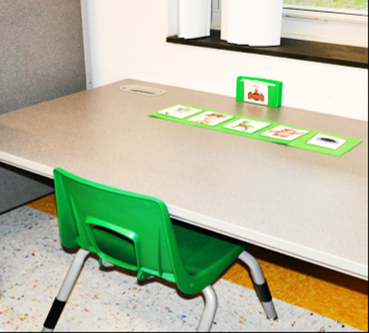 Students should be able to check their schedules, go to this center and complete the mini-schedule on the desk, all without adult intervention. I typically will practice a few task boxes during direct instruction time throughout the week. Once the student masters that task box, I move it to the Independent Work Station. I keep a list of students and the tasks that they have mastered. Myself or my paras will prep the center using this list. Some of my students can handle 3 tasks while other students can handle 5 tasks. 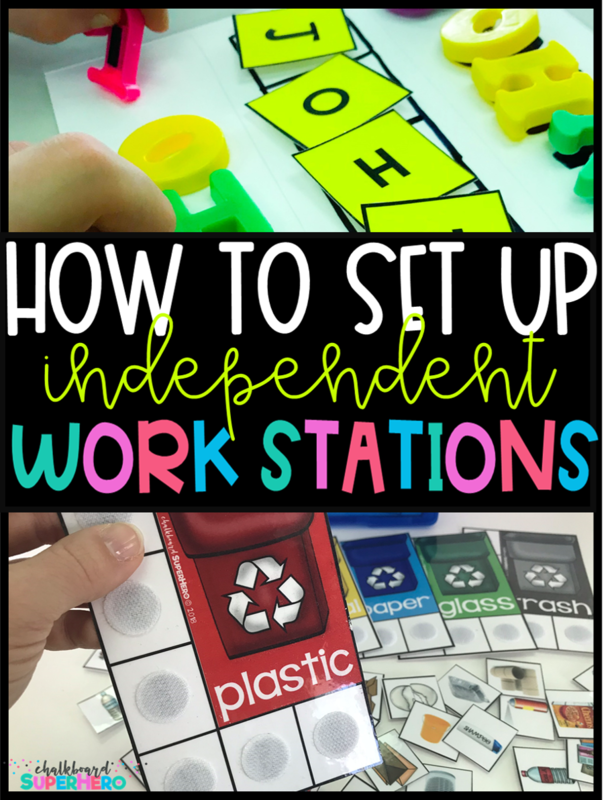 Why do I need an Independent Work Station in my classroom? Promotes Independence - students learn at a very young age how to do skills independently and will use these skills in real jobs when they exit high school. Maintenance Skills - students who get extra practice are able to maintain skills longer. Generalize Skills -students are able to generalize skills and practice them in different ways and in different settings. This skill helps generalize skills outside of school as well. 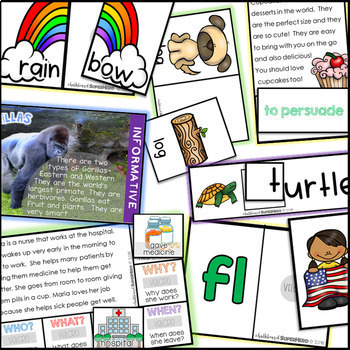 Builds Fluency - one of the biggest skill we want to teach is fluency, we don't want students to do something well, we want them to be fast and efficient as well. Engaging - students are engaged in this center and often ask to complete them on a daily basis! 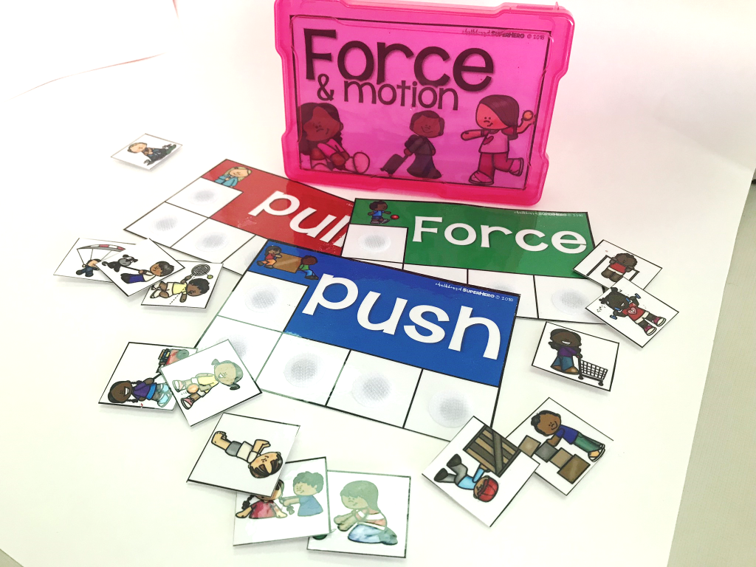 Sensory Input - These types of tasks provide an unbelievable amount of sensory input and tactile stimulation which keep them engaged. Promotes High Self-Esteem -When students are able to complete something all by themselves, they have a sense of pride and accomplishment that is undeniable. Differentiation- this is one center that you can cater to each students needs. Well, that's all for now!! Catch you next week!